1. The buffer to refill. 2. The hdd activity (Average Disk Queue length) to reach the the value of 'Avg Disk Q'. (This is a performance counter that you can monitor in the same way you do CPU usage). OR............. your HD has slipped back into PIO mode making it work harder and slower than it should and making it unable to send data fast enough to your burner. Even if it was another harddisk that was used for the programinstallation (C: ) as the burning went from H: (Internal PATA). My first reaction was to kill the burning - but I let it run. But even if the installation of that other program was done - it took long time (approx 8 -9 minutes) before it started to recover and continue to burn. Is there something that can be changed to get it up and burning faster again after this type of situation? There are some settings in the I/O tab; Main/Device/Avg. Disk. Q. But what on earth those these stand for and will changing these have changed the situation? I 20:15:58 ImgBurn Version 2.3.2.0 started! I 20:15:58 Found 2 DVD±RWs! Long time no see Cynthia. Check Hard drive Iso is stored on for errors(file system option not scan for bad sectors), Defrag the same hard drive afterwards. Suppose you could raise buffer a bit. If writer and ISO/C: share IDE maybe change that so are on seperate channels. Or stick In SATA hard drive as well. Only thing on that PATA disk was that .ISO file. Installed Java 6 update 3. C: is a SATA and the H: is a PATA. The H: is also on another channel (RAID PATA - even if the harddisk is not set up as a true RAID (=mirroring)) than the burners. The burners are on the same PATA channel. This is probably more my problem than yours, I believe it takes the average queue length of *all* drives rather than just the *source* drive, so that's why it took ages to recover (the drive you were installing to was still busy and therefore pushing up the average). Of course that doesn't really explain why the buffer went down below the threshold level in the first place - but I believe that's just the way windows works. Doing a lot of I/O on one drive will slow down all of them. Raising the buffer won't actually make it recover any quicker - if anything it'll take longer as there's more buffer to fill (but it could make the pause less likely to happen in the first place). To make it less sensitive to disk activity (and therefore start back up faster), you'd need to increase the 'Avg. Disk Q' value. 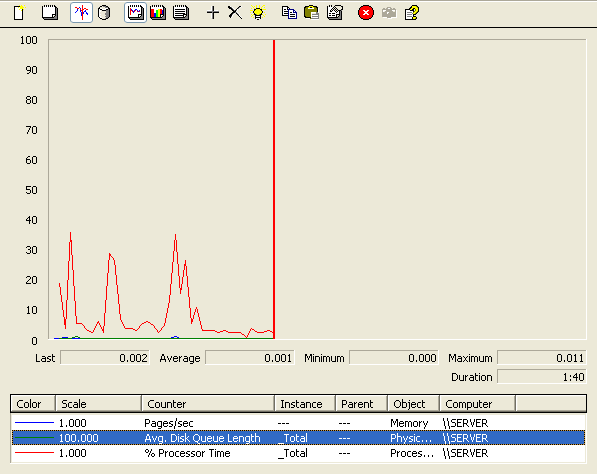 The program won't start back up until the 'Average Disk Queue Length' drops below the value you set - you can monitor that value by running 'perfmon.msc'. a 12 minute gap for such a little update? It usually takes a video conversion hitting the same drive with a 4 gig write/author that I am using for source of the burn. Tried to search on the net to see what the range 0-5 stands for - but no luck. Also ran that program - but couldn't spot that value in any of those windows or reprorts. Moved it up to 5. @chewy: The update only took a few minutes - then ImgBurn waited another 10 minutes before it started again. During that time no installation in progress. Guess it's something about an average value that needs to get down - before it kicks of the burning again. 'Average Disk Queue Length' is one of the standard performance counters. The range 0 - 5 is just my own one, it's doesn't mean anything outside of Imgburn (you could use any range). Aha. It was that one. Looks as at idle it's 1.7 in average and the highest value is 18.9. Guess it's safer not to install anything while burning. Even if that disc burned and verified ok. If yours is at 1.7 when the machine it totally idle then I guess you need to change it from the default of 0.8 to something like 1.5 - otherwise every time the buffer recovery kicks in it's going to take forever to start burning again. Can my "high" average value be because of the disk was in "sleep" mode and the time to get it up and running again - creates a "to high" average value? It could be anything where the disc is too busy/unable to process all the I/O requests. That's the idea of the 'Disk Queue'. If there are lots of I/O requests being made and the drive is too slow to cope, the queue length obviously increases - until a point where I guess the OS just rejects them or something. Is your drive a slow/old one? Is it partitioned / compressed or anything? You can see the queue length I get in that screenshot... I have quite a beasty hdd setup and it's almost always on zero when I'm not doing anything and it's hard for me to judge what a 'normal' setup might idle on. Noticed you need to manually add the strings for average que time in that M$ program. So now it looks more like your image. The H: drive is a rather old (2-3 year) PATA 160 GB disk. Only one large partition and no compression. I guess my basic problem is that the average q value takes some time (around 10 minutes - based on the burning log) to get down under the limit you can set in the preferences of ImgBurn. Here is it when it's idle. Those pics only show it going up to 0.731, which of course is still below the 0.8 default value in the settings - hence it wouldn't be waiting. would having several drives complicate the matter? P2P software? could windows kick in it's idle disk optimization and prolong the delay? As mentioned in post 8, yes it's an average over ALL the drives, not just the 'source' drive. So any activity on any of the drives would push up the average and mean ImgBurn keeps waiting. These shots are not from the time when the installation took place. I guess you need to put the M$ on monitoring to get old values. Yeah that's cool, I figured that was the case. I gave you wrongly the "processor time %" value. It was that value that was 1.7. It's the default value that shows up in that graph in the M$ program. Sorry for that. But would it not be more appropriate to use the drives q value that you use as source for the burning as trigger for the "hard disk activity to reach threshold level"? Disk activity in general will slow the system and of course the same hdd could be partitioned several times. I cannot ignore those other partitions and it was just too much of a pain to attempt to get it perfect for the number of times this issue would actually crop up - you're the first I've heard of where it waits for an unreasonable amount of time. Not only that, the burn code is the same for all modes and whilst it would be possible to get the source drive for an image burnt in Write mode, it's a whole lot harder when burning loads of folders/files in Build mode! so this phenomena is not related to burn speed? the long recovery glitch?